After Hours: Hong Kong - video door phones,intercom system,video door phone,modules.CCTV. By JESSICA YU For the millions of screen slavers emerging from a long day in a cubicle, or business travelers seeking to put an endless string of meetings behind them, Hong Kong makes an evening of recovery surprisingly easy. To start with, if you're looking to let off some steam with a little physical activity, it's a great town for walking. Not in the skyscraper forest, where the unwary pedestrian among the apparently randomly scurrying crowds feels like a human mahjong tile during intergame shuffle, but as little as five minutes out of the central business district by taxi. That's all it takes to reach the start of the Morning Trail, a well-paved, well-lit path that takes you 2.8 kilometers up Victoria Peak. It illustrates one of the greatest things about this city: How easy it is to get away from all that is "city." Thanks to the government's tight land-supply policy, the metropolis doesn't sprawl but instead grows taller and tighter -- meaning green areas stay green, large and nearby. On the trail, you'll be enmeshed within minutes by plants and trees and all sorts of natural things that are foreign to the world of shimmering skyscrapers just departed. You'll even pass a waterfall. In less than an hour you'll reach the top and a momentary interruption to the natural serenity: two shopping centers. This is still Hong Kong, after all. The Peak Tower -- which is also where the Peak Tram ends (note, for the lazy) -- offers a platform at the top for a fee, but across the street the Peak Galleria offers pretty much the same view for free. You can dine there, too. Just stop in at Il Bel Paese, an Italian deli, and pick up some fresh lasagna and a bottle of Chianti before heading to the rooftop. On an unpolluted night, the view extends to both sides of Hong Kong Island and across the harbor to Kowloon and the New Territories beyond. From here, you can really appreciate exactly how much of Hong Kong's hills are still green and undeveloped. Another place to exercise away the day's frustrations is a short ride away from work on the MTR (Hong Kong's metro). Open until 11 p.m., the City Golf Club driving range, on the water and right across the street from the Kowloon station, offers 180 bays on multiple levels -- ample opportunity to practice your swing or visualize your boss's head on a tee. (Not yours, of course, boss!) You're close enough to the towers of Kowloon that you feel you might bounce a shot off one. (To feel like Superman, take advantage of the laws of physics and tee off from the top bay.) Afterward pop out front to Thai Mary's restaurant for a beer and curry. Another of Hong Kong's relaxing resources, ranking with the green hills, is its famous harbor. And while the continual reclamation projects seem to foreshadow a day when Hong Kong Harbour becomes Hong Kong Stream, for the time being there's still plenty of water around to be enjoyed. Shop 17-18, Level 1, The Peak Galleria, 118 Peak Rd. Trip lasts from 7 p.m. until 11 p.m. Drinks: 11 a.m. to 1 a.m.
11:45 a.m. to late; rooftop opens at 6 p.m. If you want an experience that may be unique to Hong Kong, consider a squid-fishing tour. (Despite its name, the quarry is actually that squid cousin the cuttlefish; according to one local, the reason for the slight misnaming is that in Cantonese, "frying cuttlefish" is slang for being fired.) From late spring to early autumn, the waters off the New Territories teem with these boats, easy to pick out by the cuttlefish-attracting floodlights off the side and the eruptions of "Waaaaah!" when someone makes a catch. As a sport, it's not exactly marlin fishing. Your weaponry consists of standard fishing line and a jig. It takes no bait, and next to no effort; just bob your wrist up and down and wait. The boat crew cooks up the bounty for consumption on the spot, but you don't have to be in it for the eating. (There is usually also an unremarkable Chinese buffet.) The shiny cuttlefish, with the pigmentation that changes right before your eyes, are fascinating to look at, and entirely in keeping with the Hong Kong obsession with the sparkly. Or, speaking of sparkly, you can just sit back and enjoy the multicolored lights of Hong Kong as they shimmer on the water. But there are days when even the idea of laboring to catch food -- or of physical exertion for fun -- seems, quite frankly, unnecessary. We live in the modern age, after all, so let's not ignore the accomplishments of those who came before us. Instead, let us enthusiastically embrace today's world in all its effortless splendor. So how about a boat ride that doesn't take you out to catch some sea creature, but just carries you on a 45-minute cruise around the harbor and then drops you off a five-minute walk from a restaurant where they bring the food right to you? And what if your table were 28 floors up, with those same city lights spread before you? Catch the Aqua Luna, an almost-traditional Chinese junk (the vibrant red sails are for show; it's powered by an engine). Get aboard the 7:30 sailing from Central and you'll also catch the "Symphony of Lights," a nightly spectacle of flashing buildings and rooftop lasers set to music. The restaurant is on the Kowloon side: Hutong, meticulously designed from floor to ceiling to teacup to resemble an old, but very posh and dramatically lit hutong (one of the rapidly disappearing alleyways that wind through the ancient neighborhoods of Beijing). The crispy deboned lamb ribs are diet-unfriendly but completely worth it. Or forget about boats, stay on the Hong Kong side and just head for Café Gray Deluxe. Situated at the top of the newly opened Upper House hotel, this swanky escape is the world of slick, luxury-magazine photo spreads come to life. For a first plate, the green salad of foie gras and lentils is an adventure in texture and temperature, though if what you seek after a long day is warmth and comfort, the saffron pasta fiore is the way to go. For your second plate, skip the much-touted braised short rib of beef (unfortunately overpowered by a one-note sauce reminiscent of store-brand barbecue sauce), and instead go for the delicately flavored lavender grilled snapper and mashed potatoes. And tonight's not the night to pass on dessert. You deserve a treat -- and the chocolate rum toast with rum raisin ice cream is magnificent. For a more relaxed but equally trendy venue, there's the Yu Club. Decorated in glamorous retro Hong Kong style, it's intimate -- room for just 50 chic lounge lizards on its eclectic mix of plush couches, leather ottomans and brightly patterned daybeds. Like many establishments in Hong Kong, the club is technically members-only but membership is easy: Simply call ahead and ask for it (even from outside the door). General manager and chief bartender Jeff Cheng makes a great cocktail, especially for a man who says he doesn't like to drink. His Death by Chocolate is a milkshake for adults: vodka, crème de cacao, Tia Maria, Baileys, Kahlua and chocolate ice cream. And he supplements the extensive standing menu with daily offerings dictated by what's fresh at the local markets; you might get to try a Mango-Passion Fruit Martini. If you're lucky, you'll be around when Mr. Cheng is handing out some of his more whimsical creations, such as artfully assembled jello shots in flavors that include Mango Daiquiri and litchi sake. To combine a civilized drink or two or six with the pleasures of the great outdoors, climb to the rooftop bar of Wooloomooloo's new Wanchai branch. Gazing over the 270-degree view, you're the king of the city. To the right, thoroughbreds round the bend inside Happy Valley racecourse. Straight ahead, boat lights twinkle on the water and the brake lights of a thousand red taxis and Ferraris flash on the spaghetti-strand highways. To the left, dotted windows of skyscrapers reveal the silhouettes of bankers hammering out the next megadeal (or perhaps their CVs). 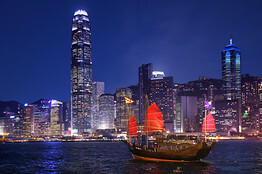 Have another sip of champagne and at long last a peaceful revel in the beautiful frenzy that is Hong Kong.